The name rotifer derives from Latin "wheeled animals"
There are two strains of rotifers offered to aquarists, the (S) strain which is Brachionus rotundiformis and the (L) strain Brachionus plicatilis. Both strains have been used as a first food for marine larvae although most hobbyists or professional clown fish breeders predominately use the L strain as this organism is still small enough to feed first stage larvae. Brachionus rotifers are a brackish organism but most rotifers can be found in freshwater, and in the ocean's columns which means they can tolerate a wide range of salinity if gradual. Sufficient aeration needs to be supplied to maintain a high density in the culture and dense cultures should be harvested to maintain continuity in a breeding programme. Cultures usually crash if there is an ammonia spike or a dramatic swing in pH therefore it is important to monitor such life critical parameters with a device such as the seneye. Rotifers are slow moving and they disperse evenly throughout the water columns. They are the right size for most demersal species (i) and their reproduction rate is rapid. This ensures a high density of food organisms in the larval tank enabling slow moving larvae to maximise development without expending more energy than necessary. Rotifers under optimum conditions, such as a low salinity and adequate aeration, with a healthy food supply, will reproduce asexually. Female rotifers can have between four and seven daughters which will also reproduce at the same rate within a twenty-four-hour period. If conditions deteriorate resting cysts are produced which hatch when favourable conditions return; some of these cysts will contain fast moving males which restart the asexual process again. Rotifers have no nutritional value themselves, it is the algae they consume that provides this, the rotifers are in effect the transporters of nutrients to the larvae. Rotifers will consume any algal species however it has been recognised that Nannochloropsis provides the optimum nutritional profile. Nannochloropsis (the main ingredient in easy reef’s products) has the maximum benefit because this small species of alga, 2 μm (microns), is high in unsaturated fatty acids (HUFA) and has a cell wall that resists bacterial breakdown. On the other hand, feeding rotifers on yeast will maintain a culture but will provide no nutritional value to the rotifers and can easily pollute a culture which in turn elevates levels of bacteria and ammonia. The alternative and by far the most convenient method is to use Easy reef phytoplankton products. Culturing most algae varieties is generally simple but does require maintenance, time and discipline. 1. First, you will need to set up a vessel with clean sea water which contains some form of nutrient, make sure your vessel has sufficient light and aeration. 2. The vessel must be inoculated with the starter culture. The colour of the water will change as the cells multiply. To create space for the phytoplankton you must remove some culture water. Phytoplankton cultures can be obtained either in a live liquid form or, if only requiring algae at a specific time, then algal discs can be a suitable alternative. Discs are in a paste form and can be used to kick start a culture as and when required and generally have a reasonably long shelf life if stored correctly. Live algae can also be purchased to feed rotifers but this can be inconvenient and expensive. The alternative and by far the most convenient phytoplankton are the Easy reef products. 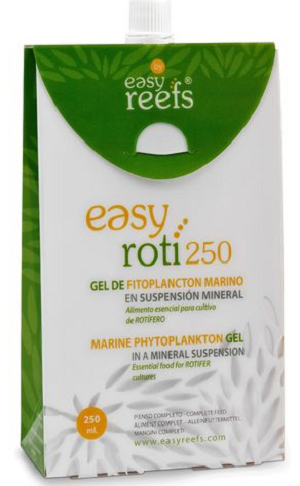 Roti rich has been developed for maximum and simplistic rotifer production, it is convenient, requires little time or effort and has all the vital nutrients live phytoplankton provide. Also, because it is held in suspension in a freeze-dried form it has a long shelf life and a concentrated dose can be made from a small amount of water. Easyrich can be used for further enrichment prior to feeding the larvae, consisting of 50% nannochloropsis and 50% Isochrysis. Easy Roti is 80% nannochloropsis and 20% tetraselmis. 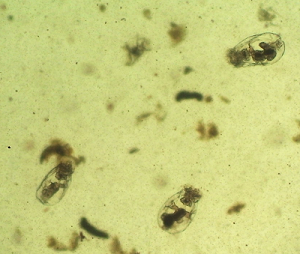 See images below of Rotifers which have been fed on easy roti! i) Fish that feed near or on the bottom of a body of water, the types of demersal fish can be divided into two categories, benthic fish which stay at the bottom of the sea floor and benthopelagic fish which float in the water column above the sea floor. ii) For example, isochrysis, which is widely used in bivalve production, will be a yellow/golden colour, nannochloropsis and tetraselmis will be green. Want to purchase easy reef products? Click on the image below for our contact information!